The global prescription dermatology therapeutics market is growing at a rapid pace due to high prevalence and increase in incidence rate of chronic and infectious dermatological disorders, and new product development and commercialization across the globe. In terms of revenue, the global market was valued at US$ 27,580.0 Mn in 2017 and is projected to reach US$ 61,296.1 Mn by 2026, expanding at a CAGR of 9.5% from 2018 to 2026. The global prescription dermatology therapeutics market is also driven by rise in adoption of biologics for the treatment of moderate to severe dermatological disorders, especially psoriasis, and large patient population with unmet medical needs across the globe. Skin is the largest organ of the body and the first point of contact for microbes and toxins. It contains a rich habitat of microbes which results in various dysfunctions. This is where dermatology steps in. Dermatological disorders differ across the globe based on geographic location, climatic conditions, socioeconomic status, lifestyles, age, gender, heredity, and personal habits. The importance of skin has increased in the past few years. Large number of people is willing to treat various dermatological diseases due to awareness. Increase in the number of indications treated with topical drugs is projected to propel the global prescription dermatology drugs market. The global prescription dermatology therapeutics market is driven by intensive research to provide treatments and/or relieve the symptoms of chronic dermatological disorders. There is large patient population suffering from dermatology disorders with unmet medical needs and the number is increasing across the globe. Leading pharmaceutical companies are striving to address these unmet medical needs through new product development. Large number of both small molecules and biologic products are under different phases of clinical trials for the treatment of dermatology disorders. Companies have made significant investments in clinical R&D and have also established strategic partnerships and collaborations to accelerate new product development. For instance, as of March 31, 2018, Aurobindo Pharma had around 38 products under development in dermatology therapeutics in topical forms. Additionally, the company has around 24 products in the portfolio that need clinical trials. High prevalence and rise in incidence rates of chronic dermatological disorders with significant unmet medical needs are projected to propel the global prescription dermatology therapeutics market during the forecast period. The global prescription dermatology therapeutics market has been segmented based on product, distribution channel, and region. In terms of product, the global market has been classified into acne & rosacea drugs, psoriasis drugs, dermatitis & seborrhea drugs, fungal infection drugs, skin cancer drugs, and others. The psoriasis drugs segment dominated the global market in 2017. The segment is projected to gain market share by 2026. Large patient population with psoriasis, long term management of moderate to severe plaque psoriasis, and high cost of biologic drugs have contributed to the segment’s high market share in 2017. An estimated 125 million people across the globe are affected with psoriasis. Based on distribution channel, the global prescription dermatology therapeutics market has been divided into hospital pharmacies, retail pharmacies, and mail order pharmacies. The hospital pharmacies segment dominated the global market in 2017 and is projected to gain market share by 2026. Long-term management of chronic dermatological disorders, increase in rate of hospitalization, and availability of high cost biologic drugs are attributed to the segment’s large share of the market in 2017. The hospital pharmacies segment is anticipated to witness strong growth during the forecast period. In terms of region, the global prescription dermatology therapeutics market has been segmented into North America, Europe, Asia Pacific, Latin America, and Middle East & Africa. North America is expected to account for significant share of 45% of the global market by 2026. 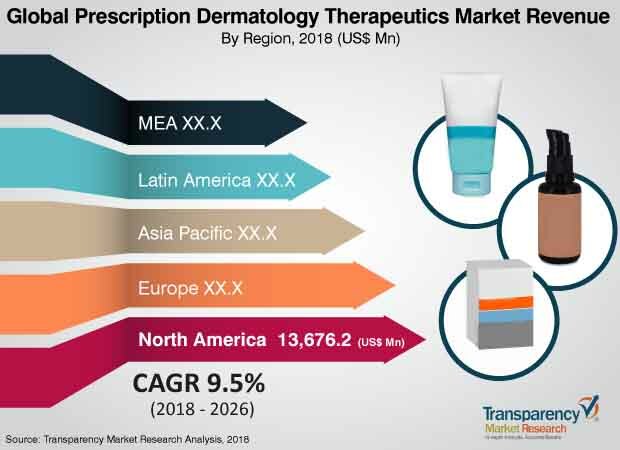 High prevalence of chronic skin disorders, increase in adoption of biologic drugs for the treatment of moderate to severe plaque psoriasis, and anticipated new product approvals are likely to fuel the growth of the prescription dermatology therapeutics market in North America. The market in Asia Pacific is projected to expand at the highest CAGR during the forecast period. Increase in awareness about various skin disorders, rapidly changing health care infrastructure, rise in access to skin care treatments in the developing countries such as China and India, well-established pharmaceutical market in Japan, and surge in adoption of biologic drugs in Australia and New Zealand are anticipated to fuel the growth of the prescription dermatology therapeutics market in Asia Pacific during the forecast period. Majority of biopharmaceutical companies have made significant investments in the clinical research and development of dermatology disorders treatment products. Mergers and acquisitions among leading players was the key trend in the global market in the past few years. Key players operating in the global prescription dermatology therapeutics market include AbbVie, Inc., Janssen Biotech, Inc., Novartis AG, Amgen, Inc., Celgene Corporation, Pfizer, Inc., LEO Pharma A/S, Eli Lilly and Company, Bausch Health Companies, Inc., Sun Pharmaceuticals Ltd., Aclaris Therapeutics, Inc., and Aurobindo Pharma Ltd. This report by Transparency Market Research analyzes the global prescription dermatology therapeutics market for the period between 2018 and 2026. An in-depth and unbiased market assessment has been made which offers readers an in-depth and accurate analysis. Market projections have been offered in terms of value (US$ Mn). Stakeholders of this report include companies and intermediaries engaged in research & development, manufacture, and marketing of products prescribed in the treatment of various skin conditions. The global prescription dermatology therapeutics market has been studied for the forecast period from 2018 to 2026. For research, 2017 has been considered as the base year and 2016 as the historical year. The global prescription dermatology therapeutics market report comprises an elaborate executive summary that provides overall information about various segments of the market. The report provides a detailed competitive landscape, by major players operating in this market along with their shares (value %) of the global prescription dermatology therapeutics market for 2017. The report also provides detailed company profiles of emerging market players operating in the global prescription dermatology therapeutics market. The market overview section comprises impact factors such as key market dynamics including drivers, restraints, and opportunities, affecting the global prescription dermatology therapeutics market. These factors are likely to aid stakeholders establish a strong foothold in the global prescription dermatology therapeutics market. Furthermore, the market overview section comprises key industry events, pipeline analysis, key mergers & acquisitions across the dermatology industry, epidemiology analysis of the skin diseases, product portfolio overview of leading players, and market attractiveness analysis in the global prescription dermatology therapeutics market. The market attractiveness analysis provides a graphical view comparing the expansion and market dynamics in various segments and countries to identify the most attractive market. The global prescription dermatology therapeutics market has been segmented based product type, distribution channel, and region. In terms of product type, the global market has been classified into acne & rosacea drugs, psoriasis drugs, dermatitis & seborrhea drugs, fungal infection drugs, skin cancer, and others. In terms of distribution channel, the global prescription dermatology therapeutics market has been categorized into hospital pharmacies, retail pharmacies, and mail order pharmacies. In terms of region, the global prescription dermatology therapeutics market has been segmented into North America, Europe, Asia Pacific, Latin America, and Middle East & Africa. Moreover, quantitative analysis for major countries comprising the U.S., Canada, Germany, France, the U.K., Italy, Spain, Russia, China, Japan, India, and Australia & New Zealand has also been provided in the report. A detailed qualitative analysis of factors responsible for driving and restraining the global market in various regions has been provided in this section. The report provides a detailed outline/blueprint of the global prescription dermatology therapeutics market which is expected to assist new companies establish their presence and companies to expand their share in the market. The report concludes with the company profiles section, which includes company overview, financial overview, SWOT analysis, product portfolio, business strategies, and recent developments of key players. Major players operating in the global prescription dermatology therapeutics market include AbbVie, Inc., Janssen Biotech, Inc., Novartis AG, Amgen, Inc., Celgene Corporation, Pfizer, Inc., LEO Pharma A/S, Eli Lilly and Company, Bausch Health Companies, Inc., Sun Pharmaceuticals Ltd., Aclaris Therapeutics, Inc., and Aurobindo Pharma Ltd.